Lucknow is the capital city Uttar Pradesh state, India. The city is served by a number of railway stations at various parts of the city. The main railway station is known as the Lucknow Railway Station which is situated at Charbagh. It possesses an imposing structure built in way back in the year 1923. The Lucknow junction railway station serves daily commuters. Some of the trains from the station are operated from Barabanki city. There are several tourist attractions in Lucknow. Jama Masjid near Husainabad Imambada is the largest mosque in Lucknow. Mohammed Shah started construction of mosque in the 1840s. Chota Imambara is the mausoleum devoted to Mohammed Ali Shah. The Imambada also comprises of a tank with small beautiful imitations of the Taj Mahal on each side. Lucknow Residency is remnants of British rule in India. The ruins of Lucknow Residency once served as the Mansion of agent of East India Company in Avadh. Asaf ud Daula is located to the right side of the Bada Imambada. The beautiful picture gallery near the clock tower offers you a number of portraits of Nawabs of Lucknow. Clock Tower in Lucknow is a must visit place for all. It stands tall at 221 feet. The Clock Tower is also the tallest of its kind across the country. The clock tower is decorated with artwork is completely European in style. The dial is shaped in a fashion to give an appearance of a dozen blooming flowers with eye catching bells surrounding it. Other tourist attractions of the city of Lucknow include Chatter Manzil, Hazratganj, Aminabad, among many more. Lucknow Railway station car rental service for events such as seminars, conferences, meetings etc. 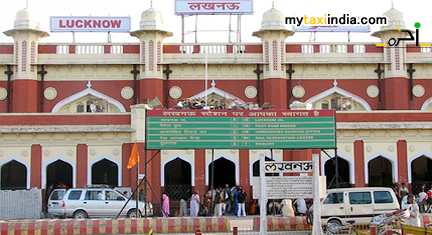 We at MyTaxiindia are committed to make your journey to the Lucknow Railway station and nearby places memorable. In case, you are looking forward to enjoy an unforgettable and memorable tour experience to and fro Lucknow Railway station and places around city of Lucknow, book taxi with us. We ensure you brilliant memories to share for a lifetime. Also you can rest assured about comfort and enjoy a wonderful tour experience across the state of Uttar Pradesh and India.